Born in Aberdeen, raised near Edinburgh, Amanda moved from Scotland to London in 1985, where she worked as a children’s Nanny. At that time, she also studied, travelled and even ran a bar in Ibiza for a Summer season. Amanda studied to become a primary school teacher, graduated with distinction and took a position at The Gatehouse, Bethnal Green. Amanda worked as a teacher for 5 years, when she decided she wanted to learn something new. 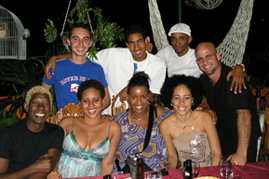 Amanda Maitland has taught in some of the best known and hugely popular salsa venues, including Salsa Palladium, La Finca, Ronnie Scott's, Turnmills, El Grande & Salsa Republic and the Cuban in Camden. Aside from her regular classes Amanda Maitland has worked as a guest teacher in The Caribbean, Cuba, Spain, London and other parts of the UK & The Channel Islands. Amanda Maitland first experienced Salsa on holiday in St Lucia and she was inspired by it, learnt to dance it and subsequently teach it. She is passionate about The Caribbean, where she enjoys, the sun, sand, sea and............Salsa!